As was reported in BreakingNews and BuildingPittsburgh on June 19, the Dept. of Environmental Protection announced today that it had issued the air pollution control permit for the operation of the ethane cracker and polyethylene production facility in Monaca. The permit was a major hurdle to overcome in the planning process for the plant. 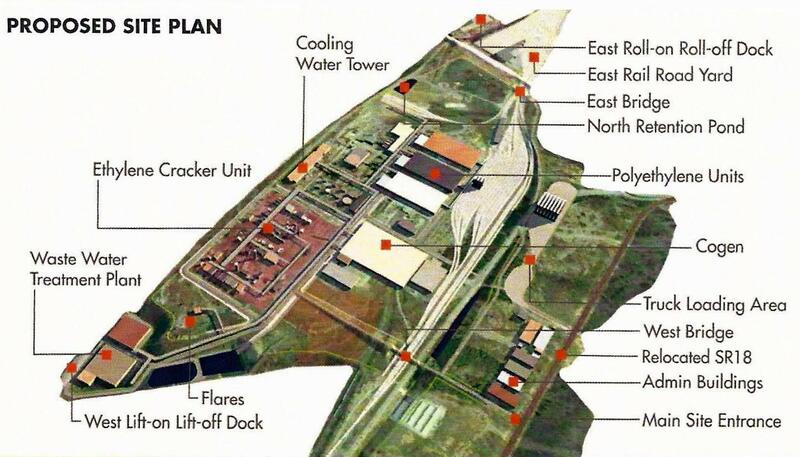 The site plan for the proposed polyethylene complex. Image courtesy Shell Chemicals. Shell spokesman Michael Marr reiterated that the permit is just one piece of the decision-making process but his comments revealed little in the way of further obstacles to the project’s progress. “Additional steps still remain, including implementing the permitted preliminary work at the site, finalizing the engineering and design work for the facility, and continuing to strengthen our long-term feedstock portfolio,” Marr was quoted saying in the Pittsburgh Business Times. Activity at the site is already heavy. The Mascaro/Trumbull Energy Services team has people working at the site, along with other early works subcontractors. A key project that should be starting soon is the construction of the marina and docks by Joseph B. Fay Co. Much of the cracker plant itself will be fabricated off site and shipped to the project by barge. Look to that project as a key indicator. This entry was posted in Construction news and tagged cracker plant, permits. Bookmark the permalink.